Septic Improvement Program Would Offer Grants and Low-Interest Financing to Help Homeowners Afford to Replace Outdated Septic Systems. 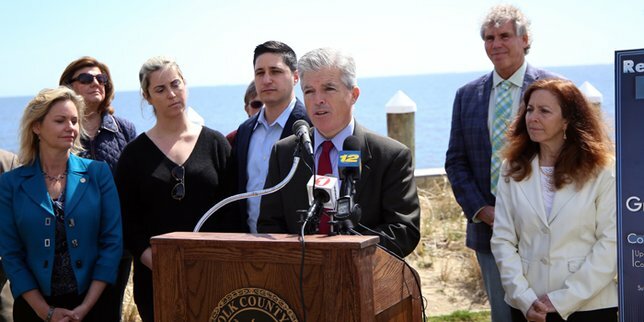 Suffolk Executive Steve Bellone announced a community outreach campaign to promote his proposed Septic Improvement Program. Suffolk County, NY - April 11, 2017 - Suffolk County Executive Steve Bellone today announced a community outreach campaign as part of a coordinated effort to promote his administration’s proposed Septic Improvement Program. In the coming weeks, a series of town halls will be held across the county so that residents can hear directly from water quality experts and officials in their own communities on how they would benefit from the program if enacted. The Reclaim Our Water: Septic Improvement Program is the first of its kind in Suffolk County designed to help homeowners fund advanced nitrogen removal septic systems at an affordable rate. By purchasing advanced wastewater treatment systems, homeowners would in turn significantly reduce nitrogen pollution and protect Long Island waters. The first town hall event is scheduled to be held on Monday, April 24 in the evening at the David W. Crohan Community Center in Flanders, located in the Town of Southampton. A specific time for the initial town hall meeting, along with several other events, will be announced in the coming days ahead so that Suffolk residents have ample time in advance to attend any meeting in their community. In addition, the County Executive Bellone urged residents to contact the Suffolk County Department of Health Services by emailing septicdemo@suffolkcountyny.gov with any questions they may have, including eligibility requirements. County Health Department personnel will be ready to assist and follow up on any inquiries for those interested. The County Executive recently introduced legislation to create this model pilot program which must go before the Suffolk County Legislature as part of a review process. If approved, the Septic Improvement Program would be administered by the Suffolk County Department of Health Services. Under the program, homeowners would apply for a grant to cover the cost of an advanced wastewater treatment system. The grant, which is estimated in the amount of $10,000 or $11,000, would enable eligible homeowners to cover the costs of systems that cost between $14,500 and $17,500. In addition to the grant, homeowners could qualify to finance the remaining cost over 15 years at a low three percent fixed interest rate. The loan program will be administered by Community Development Corporation of Long Island Funding Corp, with financial support from Bridgehampton National Bank. Comparatively, the cost to replace and install a new cesspool or septic system with no capabilities to reduce nitrogen is estimated at $6,000-$8,000. An estimated 400 Suffolk County homeowners would be selected to receive the funding under the first two years of the program. Through the year 2021, the program will be funded with $2 million each year from the Suffolk County Assessment Stabilization Reserve Fund. If approved, the program would be scheduled to launch on July 1, 2017 through an application process. Since December 2014, Suffolk County’s Septic Demonstration Pilot Program has tested new wastewater treatment technologies to reduce nitrogen pollution. Through a lottery process, the County has so far selected 42 homeowners to receive a system at no cost, including free installation, maintenance and monitoring for five years. More than 360,000 homes in Suffolk County, more than the entire state of New Jersey, rely on outdated cesspools and septic systems that do not treat properly wastewater to remove nitrogen. The Septic Improvement Program falls under the auspice of County Executive Bellone’s Reclaim Our Water initiative. Reclaim Our Water, which was launched in 2014, includes the securing of $383 million in funding for the largest expansion of sewers in Suffolk County since the 1970s and the release of the 2015 Suffolk County Comprehensive Water Resources Management Plan that provides critical recommendations on how to manage and protect the region’s water supply. Subject: LongIsland.com - Your Name sent you Article details of "County Executive Bellone Announces Community Outreach Campaign To Promote First-Ever Septic Improvement Program In Suffolk"